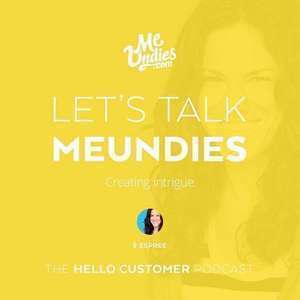 To begin, every step of the MeUndies customer experience has a real-life person associated with the communication. From their noteworthy billboard campaigns — who is Jen? — to their fashion shows and pop-up shops, to customer service representatives who are all “obsessed” with MeUndies, the brand has intentionally moved away from efficient yet overused robot-like interactions to more authentic, customized experiences. They not only fulfill their 100% satisfaction guarantee, but take extra steps to show that they actually care about each customer’s comfort. One client liked the undies but had a phobia of the color purple (also the color of the undies’ waistbands) — full refund. Another just didn’t love the undies, so they gave him a refund and sent him a Starbucks card to “treat him to a cup of coffee.” The team has even started sending out care packages for MeUndies customers who might need a pick-me-up. And at the center of every piece of branding and interaction? Finding style that’s comfortable, customizable, and efficient. Catering to a “want it now, want it my way” generation, MeUndies is making sure to present their subscription-based service in a way that encourages individual style. Collaborations with local artists for the Design of the Month undies arrive with a free gift in a “cute little bag.” Customers hit “subscribe” for no-hassle purchasing and can expect personalized service and a high-quality product, in total alignment with their desire for cooler style with less fuss. Origin of the brand: Solving a specific problem and building a niche. Why should consumers still have to go to a department store to buy nice underwear? Consistency throughout customer service is key; from billboards to Facebook ads to in-person events, the voice of MeUndies remains personal and keeps everything lighthearted. Who is Jen? MeUndies has created intrigue a cool-girl persona that they use to brand campaigns and communications. The nerd is hot! From glasses frames to undies, MeUndies understands that today’s young professional, in tech, start-ups, etc, want high quality items delivered with equally high efficiency. Everyone on the MeUndies team is “obsessed” with MeUndies. They do whatever it takes to help a customer out, from refunds to sending care packages to customers in need. Facebook is a favorite platform because customers represent themselves, and aren’t hiding behind a username. They host caption contests to drive engagement. Fashion is what you buy, style is what you wear. The goal is always to help customers find and enhance their personal style.